What is the correct amount of water to give to the wheat to be milled correctly? Already before the Second World War, researches and experiments were carried out about how to wet and condition the wheat. Obviously, there are different opinions and methods. Figure 1. Generalized block diagram of a durum/soft wheat mill. Tempering is carried out by adding water to the wheat. guarantee a constant moisture value in the semolina/flour regardless of the climatic conditions. A typical flow of mill processing is shown in Figure 1. The tendency of mills is to wet the grain after cleaning and before the debranning (point A), preferring it to other methods that are used in some case. In fact, there are milling processes that involve the use of spraying small quantities of water before the milling process begins. hyper-wetting, in which the whear is too wet and the moisture of the semolina/flour is very high (Figure 3). In both cases the mill produces semolina/flour with the moisture level outside the standard of law (hyper-wetting) or ashes (hypo-wetting). Figure 2. Chart showing a typical hypo-wetting trend. Figure 3. Chart showing a typical hyper-wetting trend. The grain is always wetted and conditioned before to be milled. The generalized diagram of a durum/soft wheat mill becomes, therefore, that shown in Figure 4. In some cases the wetting phase is carried out twice before grinding (double bath). Systems that regulate the water dosage on the market, today, continuously read the wheat moisture and manage to add up to a maximum of 10% of moisture to the mix according to the setpoint decided by the miller. The ideal and final moisture of the mix is established exclusively by the miller and his experience. Figure 4. Generalized block diagram of a durum/soft wheat mill with wetting and conditioning before decortication. 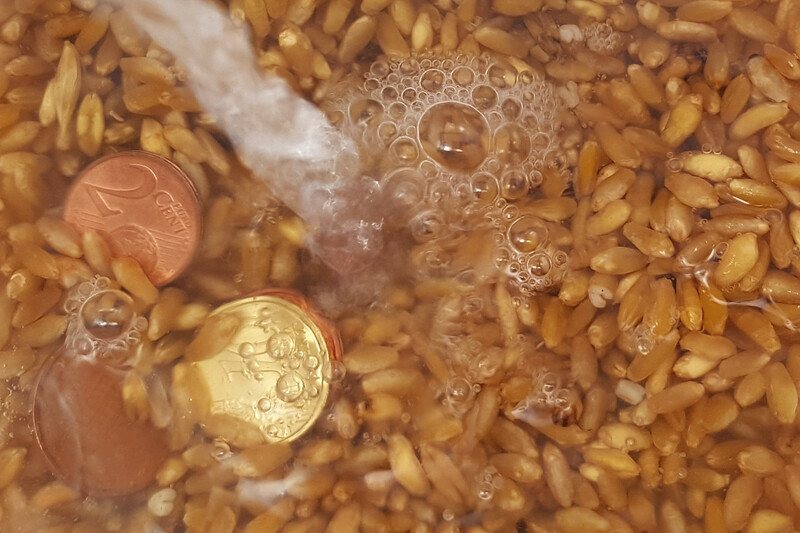 Identifying the right amount of water to be added to the wheat mix has a direct effect on the debranning phase, on the maintenance of the mill and on the constancy of the yield. After the wetting phase, the grain should rest: the time can vary from 6 to 12 hours. It is always the miller who establishes adequate resting times, to allow water to rehydrate the bran well and soften the endosperm. In case of hypo-wetting, the semolina/flour has an high ash content due to the high presence of bran fragments that pollute it (cruscal points). In the case of hyper-wetting, you will obtain a strongly moisted semolina/flour, tending to have a low ash content and reduced presence of cruscal points. In case of hypo-wetting, the ash content tends to rise due to the increase of the presence of many cruscal points and the miller is forced to send some flours to subproducts to break down the ashes and return to standard values. In the case of hyper-wetting, the mill undergoes a reduction in yield due to the excessive presence of water which increases the relative humidity in the pipes. This and the hot wheat facilitate the formation of molds, crusts and unpleasant blockages in the veils of the plansichter and purifier, with a reduction in the ability to separate bran from the endosperm. Therefore, the miller is forced to modify the roller-mills setpoint in order to restore the yield. The wheat will be milled after 6-12 hours from the wetting phase, so the right amount of water is not easy to determine because after the conditioning time there could be different weather conditions can affect heavily in the production process. The sudden arrival of heat dries the wheat fractions in milling, increasing the presence of bran parts in the finished product, forcing the miller to a continuous compensation to find the right setup of the roller-mills to lower the ashes and raise the yield. Figure 5. 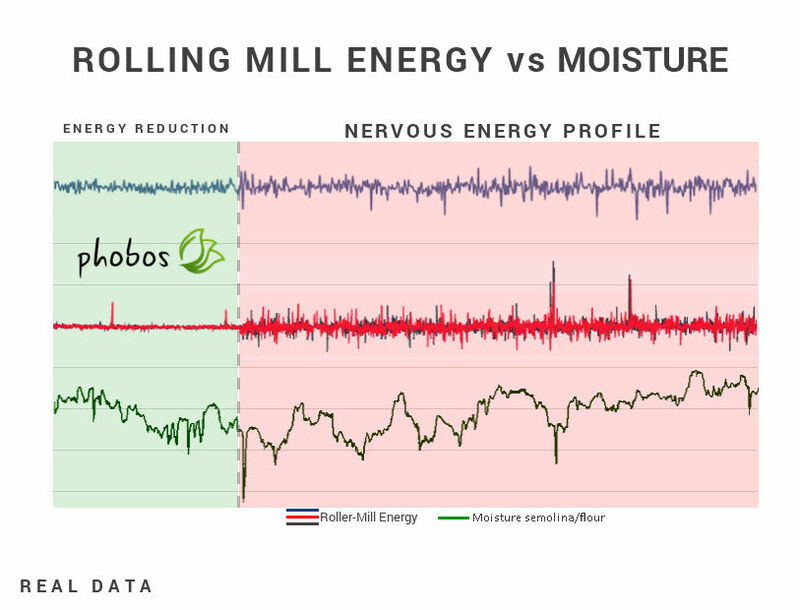 Moisture trend in semolina/flour without the use of Phobos. These weather variations affect the milling and condition the miller to change the dosage of running water to the grain that will actually be processed after 6-12 hours. The wheat will not find necessarily the same weather conditions of the wetting phase during the milling phase. Therefore the miller will be forced again to re-configure the setup of the roller-mills, continuing in an infinite loop. The continuous weather variations lead to continuous variations of humidity in the flour/semolina, as well as to yields that are not optimized due to the continuous change of machine setup. Years of experimentation, mountains of scientific research and the latest machinery are not able yet to determine an analytical/mathematical method to identify the right amount of water to add to the wheat. This value remains elusive to everyone, except for Phobos, a smart wetting system. 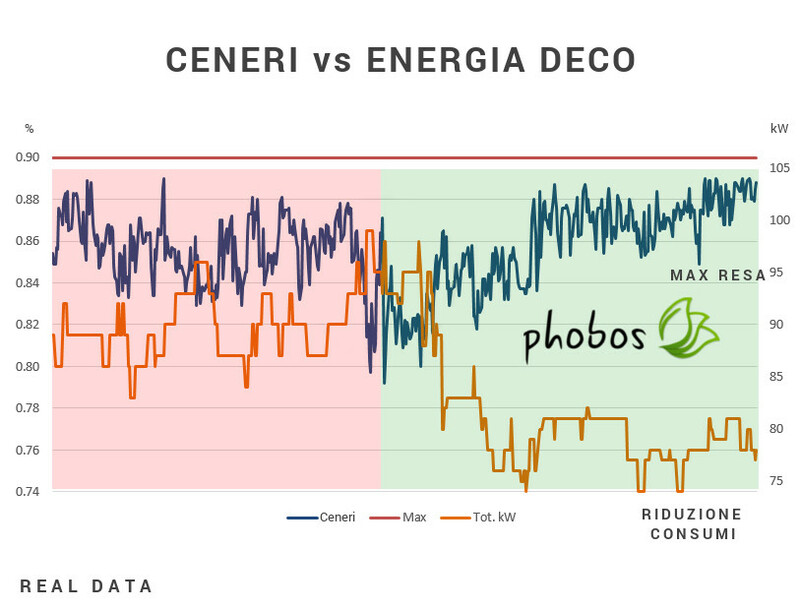 Phobos is an ILPS, an innovative device that has a low energy consumption, which monitors many environmental and process variables and is able to interpret them as an operator would. The device is equipped with a smart software that observes the conditions of the plant, the environment and what the operator does, imitating his behavior and self-correcting over time. Figure 6. Moisture trend in semolina/flour with the use of Phobos. Once the miller has established the value of moisture in the finished product, it will be able to obtain a stable humidity in the flour/semolina thanks to the application of Phobos (Figure 6). If it is a sharp change in humidity, it is likely that there is a drift of the system. The continuous compensations implemented by the miller without the use of Phobos can mask defects or malfunctions of the machines/systems and do not allow to dose the water correctly. Here are some examples: dirty water filter, setup of the decorticators, one or more process sensors not well calibrated, change of raw material, etc. The smart system Phobos considers these variables (and many others) to decide the right amount of water and learn from its own mistakes, correcting itself thanks to its self-learning algorithm. Phobos can be connected to modern supervision systems, equipped with advanced sensors, with which it can interact for a correct and collaboratively diagnosis (IoT). The experience of Caronte Consulting in the customization of Phobos is able to obtain striking results. Let’s examine someone. A strongly rooted belief in the milling world affirms that the moisture in the finished product is closely related to the air humidity and, therefore, the oscillations that the semolina/flour undergoes are mainly due to the oscillation of the ambient humidity. This relationship is a fake: Phobos, a smart system for wetting, was able to correctly identify the variables that determine the moisture in the finished products. The result was obtained after Phobos has analyzes tons of data, extrapolating those that contribute to the solution of the problem. 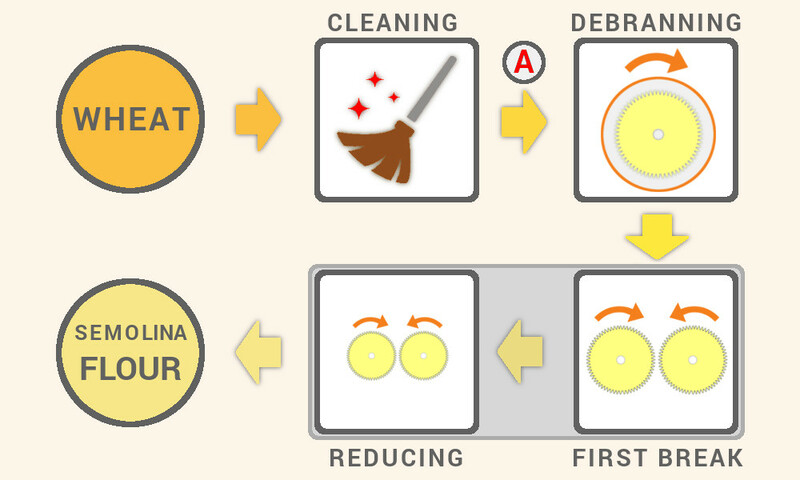 Phobos dialogues with Hydra (IoT) and this allows to further optimize the correct debranning with a consequent reduction of the energy used (Industry 4.0) to decorticate and reduce the variability of the ashes in the product (in the semolina the ashes stabilize around 0.88 ÷ 0.90, see Figure 7). Figure 7. 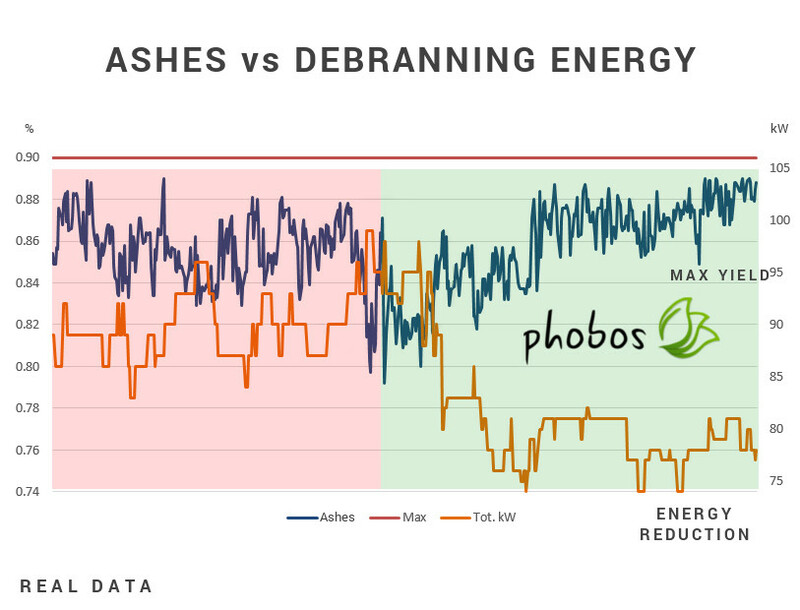 Ashes trend with the use of Phobos. The continuous change of water dosage can determine a high variability of the debranning wastes. The miller will be forced to change settings to the decorticators to keep the amount of waste constant. The grain that is not properly debranned overheats, loses moisture and produces negative effects even on the rolling mills that will have a nervous energy profile (Figure 8). Figure 8. 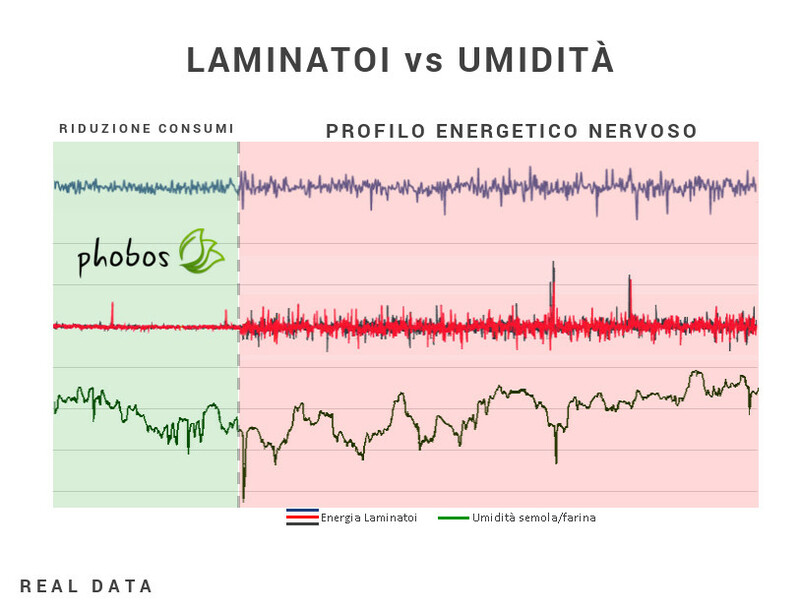 Nervous energy profile of 2 roller-mills and consequent moisture progression in the semolina/flour. Are you interested in Phobos or do you want to have a better idea about the potential of the product? You can contact us by phone, by message … or you can come and visit us!